Adobe Flash helps you build interactive websites, instructional media, engaging presentations, rich media advertisements, games and more. Designers and developers working on both Macintosh and Windows systems depend on Flash and the ubiquitous Adobe Flash Player software to ensure their content reaches the widest possible audience. Available for Microsoft Windows and as a universal-binary application for Mac, Flash CS3 Professional provides the tools you need to be successful. · Import Adobe Photoshop (PSD) and Adobe Illustrator (AI) files, while preserving layers and structure, and then edit them in Adobe Flash CS3 Professional. Optimize and customize the files during import with advanced options. · Quickly add motion to your creations with the easy-to-use, highly controllable, frame-based timeline inspired by traditional animation principles such as keyframing and tweening. · Save time with the new ActionScript 3.0 language, featuring improved performance, increased flexibility, and more intuitive and structured development. · Create, edit, and deploy streaming and progressive-download FLV content with comprehensive video support. Ensure the best video experience with a standalone video encoder, alpha channel support, a high-quality video codec, embedded cue points, video import support, QuickTime import, closed captioning, and much more. · Integrate audio into your projects by importing MP3 files. Integration with Adobe Soundbooth makes it easy to edit files as needed, without requiring audio production experience. · Visually adjust shape properties on the stage with smart shape drawing tools, create precise vector illustrations with the new Pen tool inspired by Adobe Illustrator, paste illustrations from Illustrator CS3 into Flash CS3, and more. · Leverage the Flash application programming interfaces (APIs) to easily develop extensions that add custom functionality. · Instantly convert timeline animations into ActionScript 3.0 code that can be easily edited, reused, and leveraged by developers. Copy animations from one object to another. · Design, preview, and test mobile device content using Adobe Device Central CS3, now integrated throughout Adobe Creative Suite 3. Create and test interactive applications and interfaces viewable with Flash Lite software. You cannot download any crack or serial number for Adobe Flash CS4 Professional on this page. Every software that you are able to download on our site is legal. There is no crack, serial number, hack or activation key for Adobe Flash CS4 Professional present here. Our collection also doesn't contain any keygens, because keygen programs are being used in illegal ways which we do not support. All software that you can find here is freely downloadable and legal. Adobe Flash CS4 Professional installation package is prepared to be downloaded from our fast download servers. It is checked for possible viruses and is proven to be 100% clean and safe. Various leading antiviruses have been used to test Adobe Flash CS4 Professional, if it contains any viruses. No infections have been found and downloading Adobe Flash CS4 Professional is completelly problem free because of that reason. Our experts on malware detection tested Adobe Flash CS4 Professional with various spyware and malware detection programs, including fyxm.net custom malware and spyware detection, and absolutelly no malware or spyware was found in Adobe Flash CS4 Professional. All software that you can find on our servers, including Adobe Flash CS4 Professional, is either freeware, shareware or open-source, some of the software packages are demo, trial or patch versions and if possible (public domain licence), we also host official full versions of software. Because we want to be one of the fastest download sites on the web, we host all the software including Adobe Flash CS4 Professional on our servers. You cannot find here any torrents or download links that would lead you to dangerous sites. 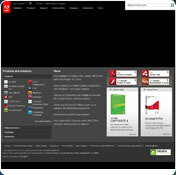 Rate Adobe Flash CS4 Professional 10.0!